Halton Stairlifts Ltd - Mobility based in Liverpool, Merseyside. Invoice history based on 340 reviews. Quality British Stair lifts That You Can Trust! Halton Stairlifts is a family firm which specialises in the supply and installation of a wide range of new and reconditioned stair lifts. We pride ourselves on offering a personal, friendly and reliable service at highly competitive prices. From that first enquiry phone call to installation can often only be a few days. For people with mobility issues, a modern stair lift can be vital for maintaining independence in a much-loved home. Forget struggling up and down stairs – with a newly-installed stair lift, you can glide to each level with ease. Stairlifts can be easily installed in less than one day, inside or outside, without costly or unsightly modifications to your home. They are simple to operate and can be folded away so they're not a hazard for the rest of the family. We use our own fully trained and highly experienced team of engineers, so can offer you complete management of your stair lift. You can rely on us from the initial enquiry through to choosing the most appropriate stair lift for your specifications and the final installation. We also offer a maintenance and repairs service in the unlikely event that there is a problem with your stair lift, assuring you that we can return it to its flawless operation. And fixed price comprehensive service and repair warranties. Our customer-focused service is based around your needs and we strive to ensure it is as convenient and trouble-free as possible. 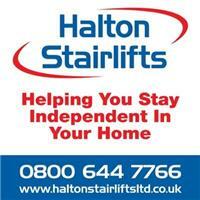 For more information on our services, contact the friendly team at Halton Stairlifts Ltd today - 0800 644 7766.